Players from the US are welcome. Instant play, no download required. Variety of bonuses and offers. First established in 2008, Silver Oak Casino was part of the notorious Virtual Group, with a long-standing reputation for slow and problematic payout procedures. But in this review, you’ll discover how the site has emerged from a murky past, with new owners and an improved reputation. The casino is now reportedly licensed out of Costa Rica and is part of the Ace Revenue group, who have gone to great lengths to correct the issues of the past and restore its reputation. Silver Oak runs on Real Time Gaming software and offers slots, table games, roulette, video poker and much more. You’ll also find a full Silver Oak Casino Mobile review below too. Let’s start this review by taking a look at the desktop version of the site. It has a no-frills layout and the first thing that grabs your attention is the large central banner advertising the latest sign up bonus; above which is a simple red banner that runs across the top of the screen. Along the banner, you’ll find various tabs, such as the Instant Play tab, as well as tabs for all the relevant links on the site: Games, Promotions, Tournaments, Winners and Sign Up. There’s also customer support tabs running across the very top of the screen. For players who want to head straight into games, it’s best to ignore the Games tab and click straight onto Instant Play. From here you’ll find icons for all games, listed alphabetically. There are also further tabs that let you browse by game type: New Games, Online Slots, Table Games, Video Poker and Specialty Games. However, players who need a little more information before diving straight into a game are best served via the Games tab. By clicking here you’ll be taken to a menu that shows featured games and clickable links for Game types. Within each game type you’ll find icons for the relevant games, plus a short write up explaining each game. Silver Oak makes it abundantly clear that Instant Play is available to Mac Users but makes no mention of the mobile casino on the desktop site. You’ll need to keeping reading this review to find out more. Signing up is a straightforward process for those over 21 years of age. So you won’t find it difficult to lay down roots and make this your permanent spot for gaming. All you need to do to get started is select the Sign-Up tab, where you will create your username and password. From there it’s a matter of entering a few details and creating your account. You can create an account on either mobile or desktop site, as your account is transferable between both platforms. Once you’ve created an account you’re able to deposit funds and take advantage of bonuses on offer or play practice versions of games for free. To get playing, there’s no need to download any software, just head straight into instant play. While Silver Oak is open to multiple countries, it’s worth reading the small print regarding bonus offers. There is quite an extensive list of countries from where players are not eligible for bonus offers. No review would be complete without an overview of the bonuses on offer at the site. If you want to take advantage of the full range of bonus codes and offers, you’ll need to install the downloadable software. The instant play facility has a reduced selection of bonuses available compared to the downloadable version. In general, bonuses are redeemed on the site by entering a coupon code at the cashier. The Welcome Bonus really does pull up trees thanks to the potential longevity of the offer. The bonus is spread out over a number of deposits to entice players into staying with the site long term. Silver Oak Casino doesn’t want you to play a few games then make like a tree and leave. There’s also a Crewpon bonus that encourages players to join up with friends and create a “crew”. The more players in your crew, the higher the bonuses on offer. For players who have downloaded the software, the bonuses keep on coming. There are no deposit bonus codes, prize draws, weekly bonuses and blackjack bonuses. Players Rewards Cards can be used at the casino to help earn rewards too. We haven’t included a bonus section in our mobile review as only the Welcome Bonus and Crewpon bonuses are listed as available to mobile players. As with most other casinos, this casino offers a VIP Program, called the Centurion Program. This is an invite-only program that offers high rollers customised benefits and promotions not available to normal players. There are multiple tiers offering differing benefits: Centurion, Silver, Gold, Platinum and Ultimate. Although it’s invite-only, players can contact the VIP department to find out if they qualify for an invite. Real Time Gaming software provides the platform upon which this casino is based, so you’ll find a decent sized selection of games - over 200 in total. Players should therefore find something to suit their tastes. The video slots section is where players can find the biggest selection of games. Most popular are the Real Series Video Slots, as they offer the best graphics and bonus features on the site. Within the library you’ll find games with up to 25 paylines and titles for animal lovers like Panda’s Gold and Builder Beaver; history lovers will find playable titles such Achilles and Cleopatra’s Gold; sports fans can get a competitive fix with Field of Green and Football Frenzy. If progressive jackpots are your thing, there’s plenty of choice with video slot offerings such as White Rhino and Goblin’s Treasure, which offers two progressive jackpots that can be triggered at any point during the game. For ultimate simplicity, there’s a range of 3-reel classics that offer old-school cool with cherries and 7’s. There are titles such as Bonkers, Lucky Lightnin’ and Sevens and Stripes. If you prefer your classics with a twist, there are games like High Rollers and Pharaoh’s Gold which offer more of a video slot feel to the classic 3-reel. If you want to take a chance on the numbers, you can spin the wheel at American or European Roulette, or toss the dice in a game of Craps. Via the Specialty Games tab at this casino and you’ll find simple games like Keno, Bingo and even scratch cards. If you like to turn your hand to card games, Silver Oak Casino Blackjack selection is there for you. There are several variations of ‘21’ games such as Blackjack, European Blackjack and Pontoon. You can also play Baccarat or scratch your poker itch with Texas Hold ‘Em and Three Card Rummy. There’s a variety of Video Poker options too, such as Aces and Eights, Joker Poker, Bonus Deuces Wild and Pick ‘Em Poker. It’s worth remembering that different games come with different wagering limits and requirements, as well as different rules for bonus features. This information is really easy to find at this casino, just head to the ‘Game’ tab, select the type of game you wish to play and then choose a particular title. Click the link to that title and you’ll be taken to a page that explains all the rules and regulations for that particular game. Money doesn’t grow on trees, so what are your payment options at Silver Oak Casino? For this review we found that deposits made by cash transfer can take up to 20 minutes, whilst everything else will hit your account instantly. To make deposits, login to your account, select ‘Cashier’ and then ‘Deposit’. You’ll then be given a choice of payment options, including Bitcoin, bank cards, Players Reward Card and more. Generally, credit card or debit card deposits made in Canada, the UK or EU countries that use the Euro will be converted into and charged to your card in US dollars. The conversion rate applied will be the daily rate used by this casino's bank. There are various withdrawal limits and time frames at Silver Oak Casino, so be sure to check these before depositing funds. There are four withdrawal methods available in the casino cashier. We haven’t included a payments section in our Silver Oaks Casino mobile review as the methods are the same. Whilst there may have been concerns about slow and dubious payout processes raised in past Silver Oak Casino reviews, security has never seemingly been in question. The site has SSL (Secure Socket Layer) technology for securing transaction servers and MD5 encryption technology for data transfer. As well as right here in this review, you can find help and information in the FAQ section of the site, where you can find answers to general queries around deposits and withdrawals, and bonus offers. Each game also has its own information section explaining the rules and bonus features in the game. If you still need help you contact Silver Oak Casino Customer Support via telephone, toll-free from USA and Canada, email and live 24/7 chat support. Now onto our Silver Oak Casino mobile review, where we discover that the mobile site has most definitely grown from an acorn that fell from the main tree of the desktop site. While researching this Silver Oak Casino mobile review we were pleasantly surprised by how straightforward it was to login. The easiest way being to simply enter the details you use for the main site. Alternatively, if you’re visiting the mobile site first, or you like to game on mobile only, you can sign up for an account via the mobile site itself. Once you’re all set up and logged in you’ll find a simple, clean and easy to use theme throughout. In the centre of the screen, there’s an icon displaying your current balance. Clustered around that are further icons to help you navigate around the site: Menu, Deposit, Table Games, Slots and More Games. Handily there’s also an icon for ‘Favourites’ where you can find your most played games for easy access, and also ‘Last Played’ which is self-explanatory. 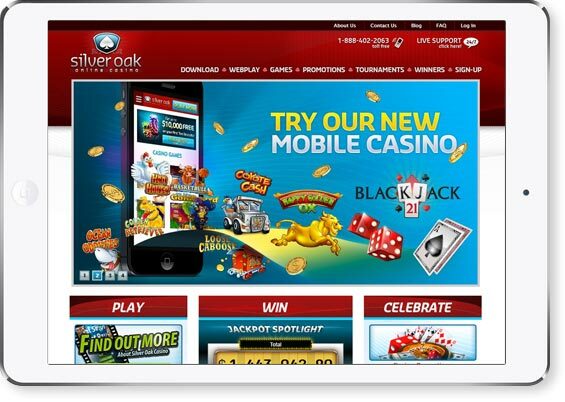 The layout of Silver Oak Casino Mobile is simple to use thanks to its intuitive controls. Icons and titles are clear on the screen, you have easy access to the tabs and each game has its title, icon and current total - if it has a progressive jackpot. Gaming via mobile is a genuinely pleasant experience and overall, an experience that we find to be superior to playing via the full desktop site. More mobile games than you can shake a stick at? Although we were satisfied with the layout in our mobile review, the same cannot be said for the game selection, which is best described as solid, if unspectacular. We found a good crossover of video slots from the desktop site and slots with progressive jackpots. Unfortunately, there are no classic 3-reel offerings available. Table games players are much better served with offerings for Poker, Blackjack, Roulette and Keno. We’re not including a payment section in this Silver Oak Casino mobile review as depositing to your account is exactly the same as the desktop site, with the same page layout and banking methods available. Both desktop and mobile sites prioritise function over style, with both sites easy to use and navigate. Our Silver Oak Casino mobile review found that the mobile site is a much more pleasant experience overall. Both sites have handy information tabs for bonuses and games with neat organisation throughout. The bonus selection is great for desktop players who download the software but limited for Instant Play and mobile users. Depositing funds seems straightforward enough with a variety of methods available and the withdrawal issues of the past seem to be left behind. All in all, we’ve found that both sites are as solid and sturdy as the name suggests.